Budget Buster! 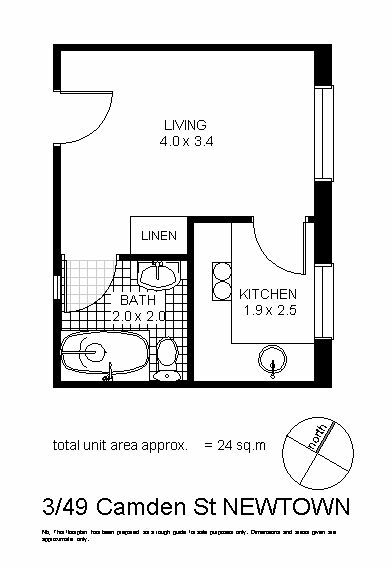 Studio Apartment in Newtown! Quiet, private and secure this ground floor security studio is situated in the leafy streets of the Newtown/Enmore precinct, within a boutique complex of 15. Comprising of a light filled open plan living/sleeping zone, modern kitchenette and a neat bathroom with bath/shower. A coin-operated laundry is located within the complex. Offering a central location, moments from the excitement of King St/Enmore Rd or the relaxation of Enmore & Sydney Parks and is a stroll to Newtown station making the CBD commute a breeze. A perfect investment or first step into the property market!